Bud Light is releasing new ‘Dilly Dilly’ creative during one of the biggest football days of the year – Thanksgiving, and it features a royal feast with the newest characters in the series. 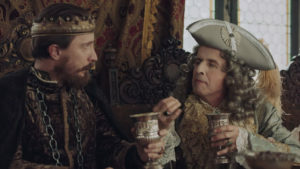 In the 45-second spot by Wieden+Kennedy New York, the King character sits at a table with the pasty and very proper Count and Countess Pamplemousse, whom we met during the last Bud Light outing. The King states, passively aggressively, that even though the Count refuses to try his kingdom’s favorite lager, he will graciously try the Count’s mead. As he prepares to sip the concoction, the Count stops him to describe the “mouth feel” and “layered aromas” with a “tinge of sour cream.” After further goading, the King finally snaps and states that he can’t do it and beckons for a Bud Light. He then sends the Count and Countess off to the wine cellar, which ends up being a dungeon.